we had a problem here in the little row house. we have a very strange and half-assed (sorry, there’s really no other way to describe it, truly) middle bedroom/closet. at some point, some past owner decided to collect everyone in the neighborhood’s cast off wood scraps and make himself a dressing room. or herself, i don’t really know. anyway, it’s so bad, i could write a small volume of poetry dedicated to its crappiness. but, i won’t do that here, don’t worry! the “room” is very small, and it lacks such standard bedroom features as a window or a radiator. both kids were in the back bedroom. this sounds like a good idea, until you try to put both urchins down for a nap. suddenly, not so good. so, we needed a big boy bed. since we couldn’t find anything that would fit AND that was completely free, hubberson decided to make one. it is perfection in a bed, people. 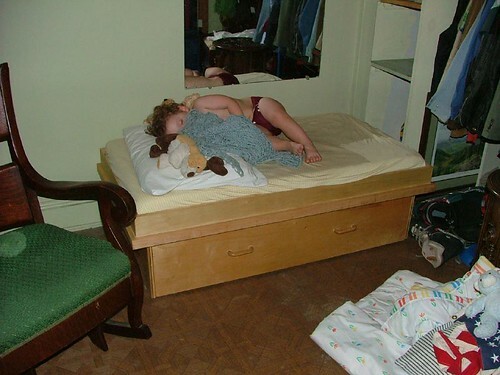 it has a drawer underneath for storage (or, as z-man would tell you, for sitting in and playing the snare drum with a hockey stick), and it uses the crib mattress, so it’s the perfect size. the only small problem with this new arrangement is that the child won’t nap. he just gets out of his bed, comes out in the hall, and looks at me as if to say, “come ON, mama. there is no way in sesame street i am ever napping AGAIN.” so, there’s 2 hours of solid daily productivity out the window. i’m also gearing up for my business’ national conference, which i shall never blog about, lest i break the rules of stated business, er… right. leaving for the conference soon, and wanted to make some FLAIR for my team to wear on their little conference-y lanyard thingys, you know, so everyone can see they’re on the dorkiest team in the USA. or perhaps even the UNIVERSE. 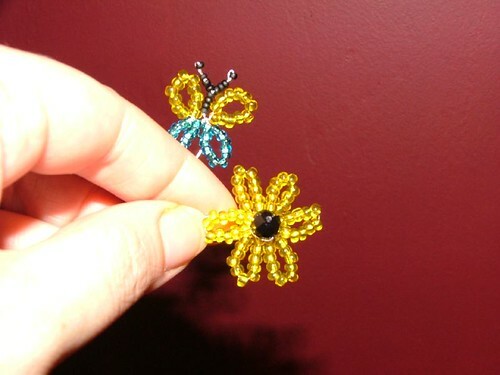 i settled on beaded black eyed susans, the maryland state flower. they’re cheesy, on safety pins, as that’s what i had, but cute i think. there’s a butterfly, too, just because you can’t have one without the other. head over to my sister cindy’s cute new site for some adorable personalized baby gifts, if you need some- these little numbers are the only way i can remember zander’s vital birth stats. it was an emergency c-section, they gave me morphine. i was totally out of it. This entry was posted on July 31, 2006 at 10:28 pm and is filed under crafting, life in general, musings. You can follow any responses to this entry through the RSS 2.0 feed. Both comments and pings are currently closed. OOOoo, those are cute. I’d be proud to wear one or several on a lanyard, but I’m like that. Cute pictures of the kids. I especially like the one of the sister and brother long-distance in the field. Zander sleeping is cute, too. Sage reminds me of Kathy Seibert when she was Sage’s age.